Producer: Hannah Reimann Innovations, Inc.
Hannah Reimann’s self-produced film, a love letter to her father, tells the story of her father, Dr. Peter Reimann and his trauma-related dementia, her sister Kim, their devoted Korean housekeeper, Mrs. Man Cho Lee, and herself. 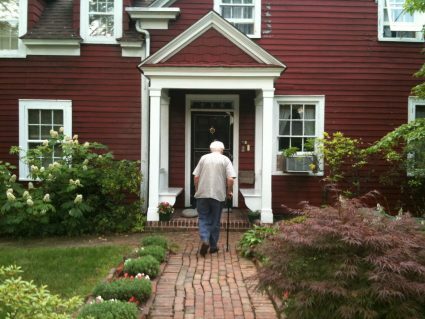 Their life in suburban New Jersey serves as the backdrop for a universal story about dementia, death and dying, albeit within the context of their unique personal experiences caring for Dr. Reimann in the last three years of his life. My Father’s House touches us in the rather deep places we don’t often venture. The film allows caregivers to see that there are others going through similar circumstances and that they are not alone. It assures us that the path of caregiving, however painful and unpredictable, is a worthy one, one that redeems and one that rewards us with the silent, unforeseen promise of comfort and peace at the time of a loved one’s death. My Father’s House shows us that death is not something to be feared, but to be embraced in the context of a fatal illness, empowering both the living and the one who has passed. Hannah Reimann (Director/Producer) is a singer, pianist, composer, educator and filmmaker born in New York City to German and Korean parents. She has performed classical, singer-songwriter and other musical genres in halls and festivals in the US and abroad for over two decades. Her CD, First Songs, in radio rotation for over 15 years, features her “extraordinary voice” (Sirius/XM Radio) and her Joni Mitchell retrospective is praised by The New Yorker Magazine for her “uncanny” interpretations. She is also an actor with roles in over 24 film and theater productions. Reimann’s short films include Destroying Angel (2012) (New Jersey Film Festival, Long Island International Film Expo) and My Father’s House: A Journey of Love and Memory (2017).